Learn to navigate the flying trapeze on this 1.5-hour lesson in Las Vegas. Gather up your courage, chalk up your hands, and grab a bar to fly high above the ground with the direction of an experienced instructor. Learn the basics of hanging by your knees, then release your hands when you’re comfortable. At the end of your session, attempt a release-and-catch with one of the professional catchers. Make your way to Trapeze Las Vegas, located just 15 minutes from the Las Vegas Strip. Be sure to wear comfortable clothing suitable for athletic activities. 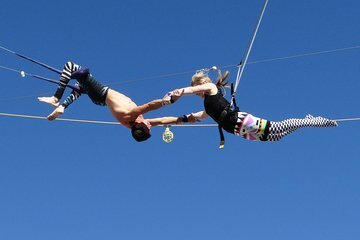 Meet your professional instructor and get a brief orientation to the art of the flying trapeze. Chalk up, grab the bar, and take off. Start by learning how to perform a basic trick — the knee hang— on a trapeze bar that's low to the ground. Once you've got the hang of it, get three opportunities to try the trick on a full-sized trapeze bar high above the ground, protected by a net. After your practice rounds, feel the thrill of the catch-and-release, aided by a professional catcher. Swing by your knees, release, and get caught in mid-air. Walk away from your 1.5-hour lesson with your blood pumping and a sense of accomplishment.